Whenever I’m at Hobby Lobby I ALWAYS peruse the fabric section “just to see what they have.” Our new house is closest to this craft store chain, so I’ve been hitting it up frequently. This last trip there, I found this beautiful mint green lace in the seasonal rack. One thing you should know about me is that I have a deep seated love for the color mint green. I even incorporated it into my AOL screen name – remember those? 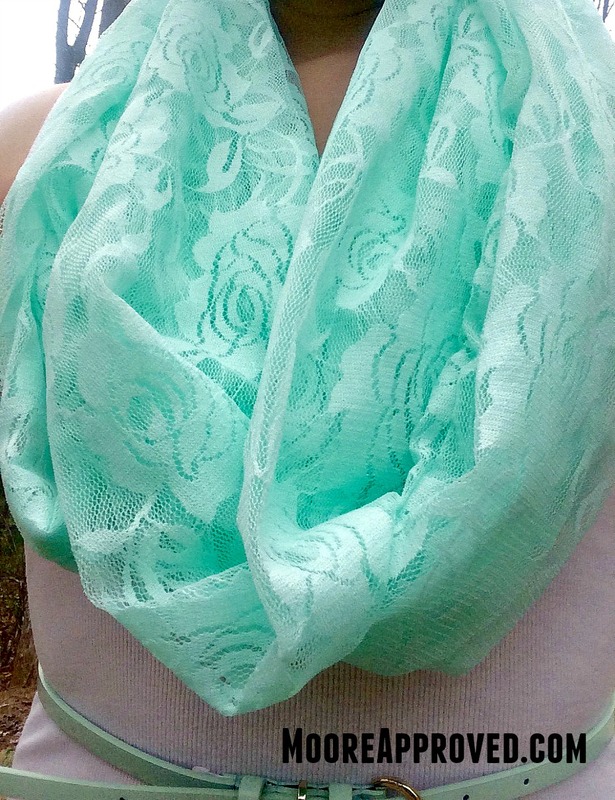 I’ve been coveting this lace knit scarf in the color mint from Grace & Lace for a long time, but disliked the $33 price tag. 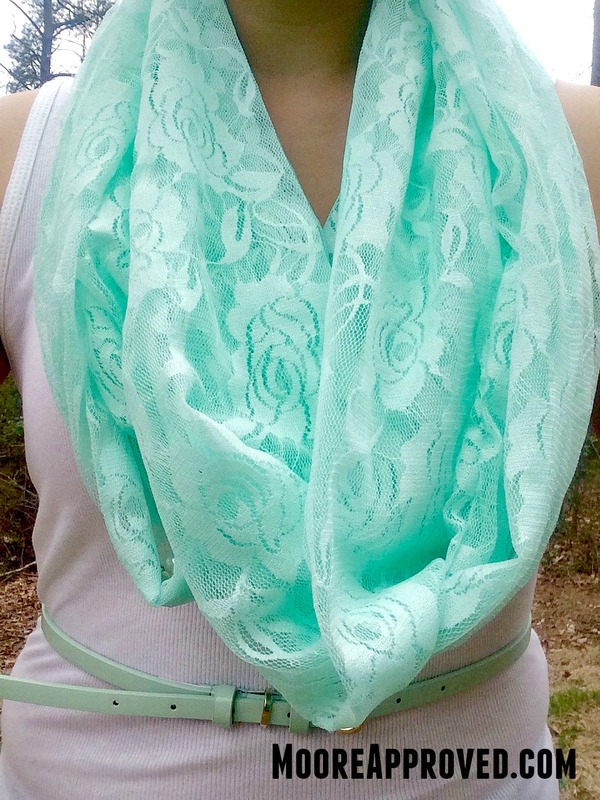 So when I saw the mint green lace, I immediately felt the need to make an infinity scarf. By purchasing two yards of the lace, I had enough material to make not one – but TWO scarves! The dimensions were originally 58/60 inches by 72 inches. First, I cut the lace in half lengthwise so I ended up with two pieces 29/30 inches by 72 inches. An easy way to do this is to fold the longer side in half, fold in half again – then fold in half the opposite direction and cut on the fold. Using Wonder Clips, I secured the ends together for the entire length of the lace. This worked well and the material did not slide around. With at least a 1/2 inch seam allowance, sew into a tube. (Helpful hint: use a zigzag stitch, overcast stitch, or serge. A narrow three-step zigzag stitch worked very well for me.) I had matching mint green thread on hand – be sure to use the same or very similar color as your fabric. Otherwise the thread will be quite obvious in your scarf. Here’s what the three-step zigzag stitch looks like on lace. Lay out the tube on the floor or table, and start pulling one end in toward the other. Line up the ends RIGHT SIDES TOGETHER. Bring out the Wonder Clips again and starting with the seams, secure the ends together. It was easiest for me to start with the seams (clip seams open), and then clip the opposite end, working my way to the middle. Starting just before the seam, sew the ends together – leaving a two inch opening for turning. 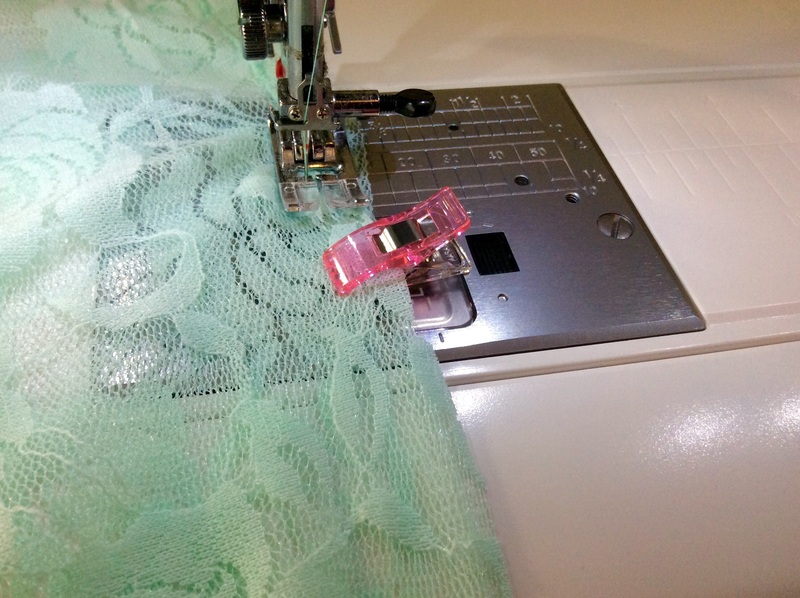 Other tutorials recommended a larger opening, but with lace – two inches works just fine. Instead of hand sewing the opening closed with a slip stitch, I edge stitched. Because the opening was so small, it’s hardly noticeable. Seriously, who wants to hand stitch when you don’t have to? And that’s it! Really. You’re done. This is me outside awkwardly trying to take selfies using the iPad’s front facing camera while wearing my new infinity scarf. No makeup = no face shown. This is an easy, quick sewing project. Making two scarves took just under two hours, and I plan to keep one and gift the other. 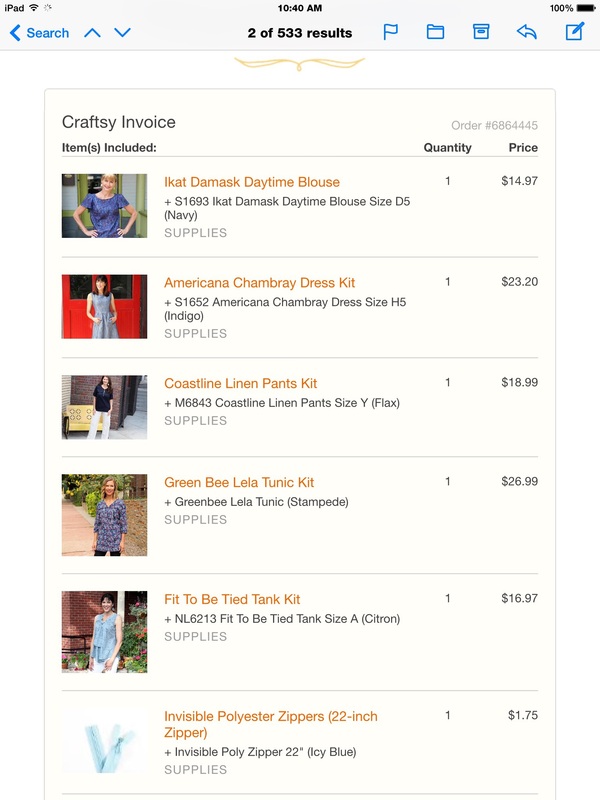 If you’re like me and haven’t made garments before, it’s a great way to dip your toe in the water. Using fabric like knits or lace make it foolproof, and I can tell you that I was not careful about keeping my seams even. At Hobby Lobby, the mint green lace retails for $6.99 per yard, but with my 40 percent off coupon – two yards came out to around $8. This equates to just over $4 per scarf – not bad compared to similar scarves going for $9.99-$19.99 at Target. While searching online for pictures of similar scarves, I actually found an Etsy seller peddling handmade infinity scarves out of identical fabric. She is charging $20 – a fair price taking into account time and materials. If you don’t want to sew one yourself, you can certainly buy one. Personally, I didn’t mind spending an hour and $4 to make my own. If you decide to make one of your own – post pictures on social media and tag me at @MooreApproved and #MooreDIY. This may be a huge mistake, but I placed a Craftsy order for five sewing kits that include a paper pattern and enough fabric to make each project. There was a “Spring Blowout” sale that made these kits irresistible – I wouldn’t even be able to buy the fabric alone for the prices offered. I chose a pair of pants, a dress, and three tops. Quite honestly – I am scared. To prepare, I’ve been watching YouTube videos. Creativebug has some fantastic free technique videos. I will be posting more about my foray into garment sewing once my kits arrive in the mail. Any advice for a novice? Feel free to leave in the comments!